I love Tamales. I like to think of them as a healthier mexican Hot Pocket. They are wonderfully delicious, not completely awful for you and extremely versatile allowing for different combinations of ingredients. Plus they store well. Apparently, the tamale traces back to 5000 BC! During wartime, for the Aztec, Mayan and Incan cultures, the women became unable to keep up with cooking and food preparation and invented the tamale out of necessity for a more portable, sustainable foodstuff. It must say something to the quality of the recipe that Tamales have lasted this long and are still regularly enjoyed in a complex variety of South American cultures. All history and tamale love aside – they are not easy to make. At least the first time. 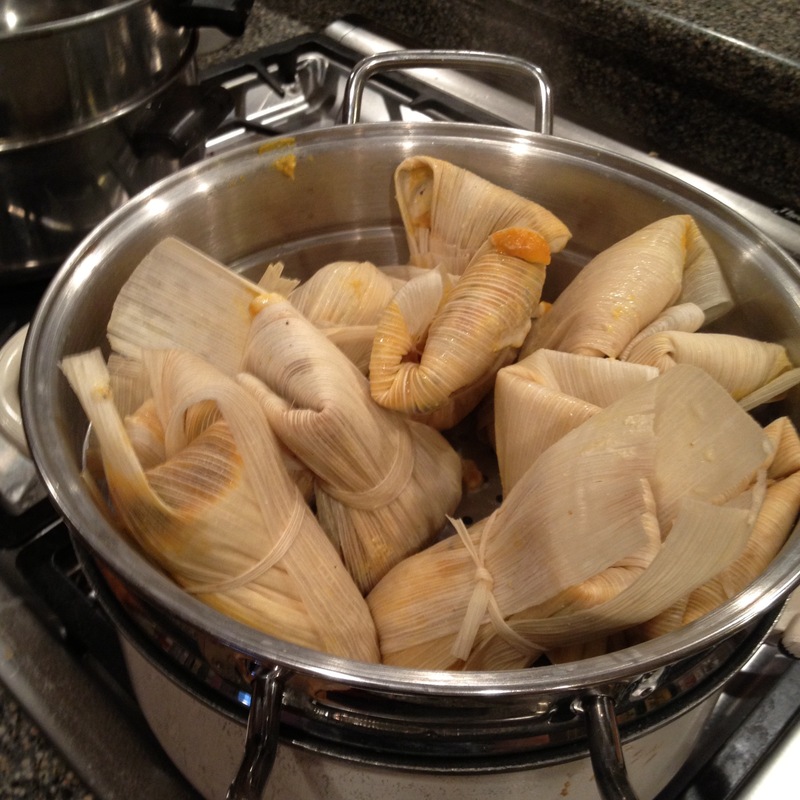 Tamales are steamed in a leaf or corn husk and are supposed to be rectangular. I found it to be quite difficult to get my tamales to be any decent shape at first. However, after some serious practice, my corn husk tying skills improved. And rectangular or not, they were delicious. The tamale recipe that I am going to make here is vegetarian as I don’t consume any meat (fish withstanding) but tamales generally are made with pork or chicken. This recipe came from Eating Well but I have tried to simplify it as much as possible. 16 Corn Husks, available for cheap at Hispanic grocery stores or for expensive at very fancy ones. The first step is preparing your corn husk wrappers. As they are sold dried, the corn husks should be soaked in warm water for at least 30 minutes. This makes them more pliable. Making the batter: Start off adding the masa and 1 1/4 cups hot water to a large bowl and stirring with a wooden spoon until it is dough-like. In a separate bowl, beat the ricotta, oil, baking powder and salt with an electric mixer on medium-high for two minutes. Reduce the mixer speed to low and add the cornmeal. I found this part to be quite difficult as my mixture became really firm. I ended up adding a little water to the blend in order to soften it up a bit. Now mix the two blends together and slowly add the vegetable stock, about a 1/2 cup at a time until you get a moist, spreadable batter. Making the filling: This part is really easy. Simply defrost your frozen winter squash and mush it up (technical term). Try to drain as much excess liquid from the squash as possible. Next, stir in the beans,salt and green chilis and voila – filling is done. Putting it all together: On a clean surface lay all of you corn husks out. Try to pick larger ones and tear the smaller ones into 16 12 inch ties. Spread 1/3 cup of the batter in the center of the husk in a 4-inch square, leaving plenty of space at the top and bottom. On top of that, add about 2 tablespoons of the squash filling. Top with a bit of goat cheese. My setup looked like this. Now here comes the hard part. 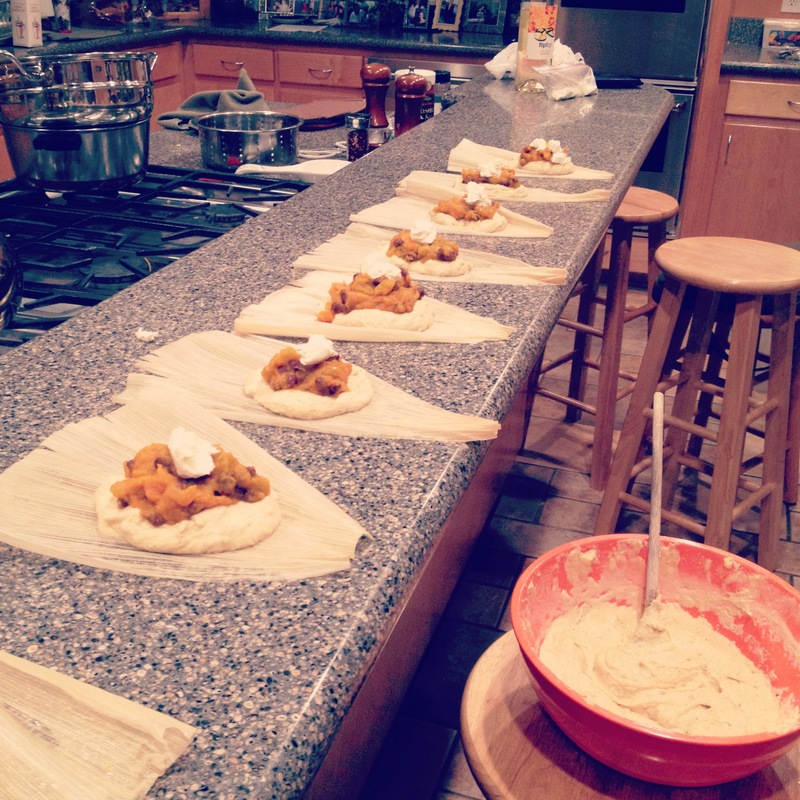 Wrapping tamales. It it very similar to wrapping a present, that is gooey and moves a little. First fold in the top and bottom of tamale. Now fold the sides in and wrap with the ties made from the smaller corn husks. The key in this is to not put too much batter/ filling into the husk so that it leaks out the side. Finally, steaming the tamales: I had used an old pot and a colander and it worked wonderfully but I am sure that many of you have better set-ups. In the picture below you can see where I had some problems in the wrapping. Cover and steam for an hour making sure to check the water levels in the pot. The tamales are done when the batter is firm and easily pulls away from the wrapper. Enjoy! 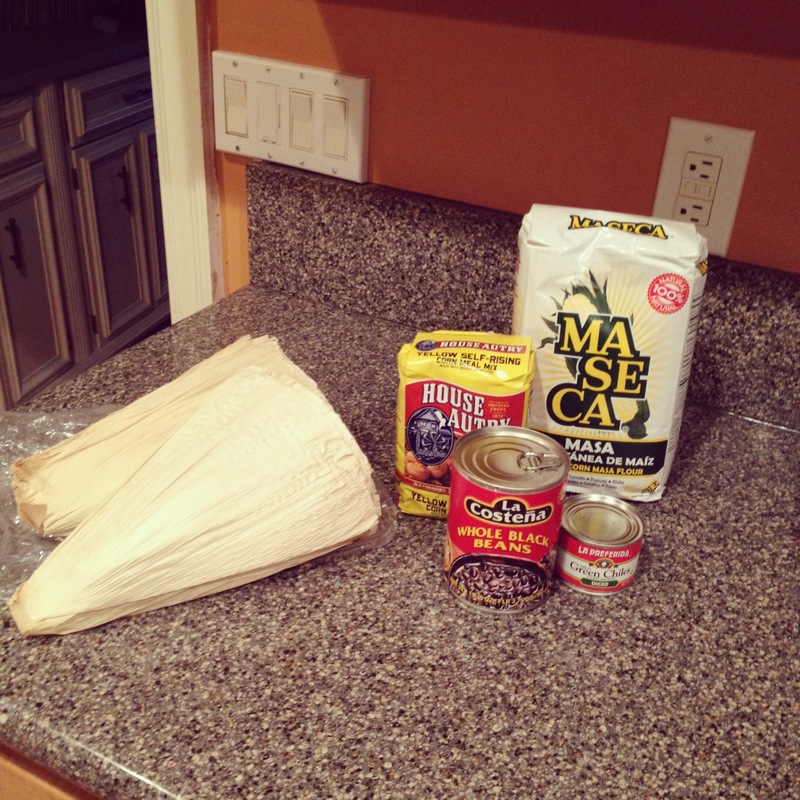 Tamales can be kept enjoyed immediately, refrigerated for a couple of days or frozen for up to 3 months. To reheat, simply throw them in the microwave for a minute or so. Per tamale: 232 calories; 7 g fat ( 3 g sat , 3 g mono ); 10 mg cholesterol; 35 g carbohydrates; 8 g protein;4 g fiber; 612 mg sodium; 130 mg potassium.